Create with Gwen: Thanks for being you Card! Thanks for being you Card! It's here! 2016 Occasions Catalog goes live to customers Tues, January 5th! AND...Sale-a-bration Event is back! Awesome Sauce! 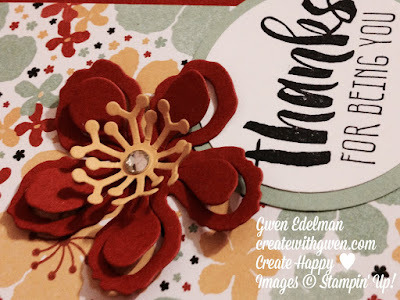 I'm loving so many of Stampin' Up! 's new products, it would be a very, very long post if I posted them all! This card is one that we are making at club using on of my favs! The Botanical Gardens Suite has endless possibilities! Oh, especially the Dies! Aligning the large leaf die on the edge and running through the Big Shot, gives the card a unique look! The flower die cuts are delicate and stunning! Hope you enjoy these samples and please share what you create from both these new catalogs!